--» Wafer/Frame Film Mounters Mounts film frames to pre-diced wafers for subsequent dicing, cleaning, curing, expanding, etc. --» UV Curing Systems Cures UV tape -- which reduces initial high-adhesive strength -- for easy pickup of die from post-diced wafer. --» Die-Matrix Expanders Uniformly separates die on wafers and attaches a grip ring, allowing easier pickup of individual die. --» Wafer Cleaning Systems Immaculately cleans diced wafers by utilizing either a brush or brushless design. --» Wafer Backgrinding Protective Film Remover Delicately & uniformly removes the protective film that covers thinned wafers. --» Wafer Backlapping Film Applicator Uniformly and precisely applies a protective film to pre-thinned wafers for grinding. --» Film/Tape - (Silicone-free Adhesive) We are proud to be the manufacturer producing true Silicone-free film! --» Film/Tape - (Standard UV Adhesive) Exceptional quality film: Consistent and high adhesive strength & uniform elongation properties. --» Film/Tape - (Antistatic UV Adhesive) Our antistatic UV film dissipates negative ion buildup while retaining demanding standard film properties. --» Grip Rings Our grip rings are extremely strong, and are made to last! --» Film Frames Our 6" film frames integrate with 6" grip rings. 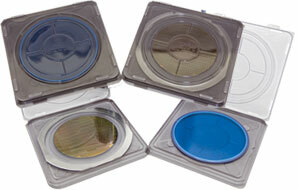 --» Grip Ring / Film Frame Shippers Our shippers will hold the same-sized grip rings or film frames. --» Grip Ring Separator Tool Easily separate grip ring segments with our useful tool. --» Grip Ring Magazines Durable magazines for USI grip rings: Available in 6", 8", and even 12" size!